Wing Commander Ravi Khanna was born on a New Year’s eve on 31 Dec 1964 and was commissioned as a Fighter Pilot in the 138th pilot course on 06 Dec 1986. Being a seasoned Jaguar pilot, he was posted as the Commanding Officer of one of the prestigious Fighter Squadrons of the IAF nicknamed ‘Dragons’ with effect from 23 Jul 2003. Wg Cdr Khanna was known to be a thorough professional who led his squadron competently. Under his leadership the unit not only accomplished all assigned tasks to perfection, it also set exemplary standards for others to emulate. During Eklavya 2003, his Squadron bagged five trophies out of a total seven and was adjudged overall best in the gunnery meet. Leading from the front, the Dragons came first in three team events of which he led one and participated in another. Under his command, the squadron was declared the ‘best Fighter Squadron’ in the Indian Air Force. As Commanding Officer of the unit, Wg Cdr Khanna had taken the Squadron to participate in the prestigious exercise Vayu Shakti ’04. On that clear and cold Thursday morning of 26 Feb 04, he was to fly as No. 3 in a four aircraft formation that was to drop a 1000 pound retarded bomb over Pokhran Range as part of a battle inoculation exercise. 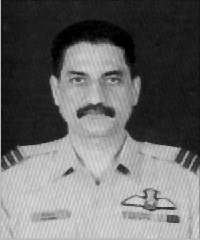 During the mission, after locating the target and releasing the bomb, it exploded in air very close to the aircraft causing the aircraft to disintegrate, resulting in fatal injuries to Wg Cdr Khanna. Throughout his tenure as Squadron Commander, he insisted on maintaining the unit at a high level of professional standards. For his exceptional devotion to duty, Wing Commander Ravi Khanna was awarded the Vayu Sena Medal (Posthumously) by the Hon’ble President. 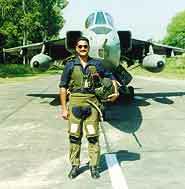 Wing Commander Ravi Khanna (18565) Flying (Pilot) was commissioned on 06 Dec 1986. He was posted as Commanding Officer of a Fighter Squadron with effect from 23 Jul 2003. Wg Cdr Khanna was a thorough professional and he led his squadron competently. Under his leadership the unit not only accomplished all assigned tasks to perfection, it also set an example for others to emulate. During Eklavya 2003, the Squadron bagged five trophies out of a total seven and was adjudged overall best in the gunnery meet. The Squadron came first in three team events of which he led one and participated in another. It was also declared as the best Fighter Squadron in the Indian Air Force. As Commanding Officer of the unit, he had taken the Squadron to participate in the prestigious exercise Vayu Shakti?04′. On 26 Feb 04, he was authorized to fly as No. 3 in a four aircraft formation that was to drop 1000 pound retarded bomb over Pokhran Range as part of a battle inoculation exercise. During the mission, after release, the bomb exploded in air very close to the aircraft causing the aircraft to disintegrate, resulting in fatal injuries to Wg Cdr Khanna. Throughout his tenure as Squadron Commander, he insisted on maintaining the unit at a high level of professional standard. For his exceptional devotion to duty, the Hon’ble President is pleased to award “Vayu Sena Medal” (Posthumously).